Available Both RoHS Lead-Free and Classic Tin/Lead Formulations! On the market for two decades, LowMelt® DeSolder Wire is a time-proven, high quality method of how to desolder and remove an SMD chip quick, easy and below 302°F (150°C) without lifting pads, burning, delaminating or measling your PC board. You choose: a.) Classic LowMelt® for classic tin/lead solder work or ZeroLead® LowMelt® RoHS lead-free solder. Both are in stock and ready to ship today with MSDS docs included. Chip removal with LowMelt® can be achieved with either a soldering iron or, preferably by simply preheating the bottom of the PCB (see the short video), applying flux and LowMelt®, letting the co-metalization process take place, and then lifting/removing the chip. No nozzles are needed at all. 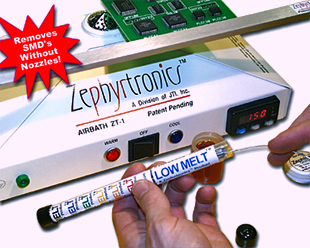 The amazing synergy of LowMelt® and the Zephyrtronics® world-famous AirBath™ PCB pre-heaters has been evaluated, tested and approved by some of the world's most prestigious aerospace and defense contractors and are used around the globe daily in PCB prototyping, rework and repair.